For as long as most of us can remember the 17th of September finds us making our way to Lourdes as part of the annual Oblate pilgrimage. This year brings with it new pilgrimage dates, 14th – 19th September. This change was brought about by the increasing difficulty in sourcing airlines that are prepared to transport pilgrims who are ill or require assistance to Lourdes. There will no doubt be other changes as time goes on. At the beginning of the year, let us implore from Mary the grace to be amazed at the God of surprises. Let us renew the amazement we felt when faith was first born in us. The Mother of God helps us: the Mother who gave birth to the Lord, now presents us, reborn, to the Lord. She is a mother who generates in her children the amazement of faith, because faith is an encounter, not a religion. Without amazement, life becomes dull and routine, and so it is with faith… Let us allow ourselves to be gazed upon. Especially in times of need, when we are entangled in life’s knots, we rightly lift our eyes to Our Lady, to Our Mother. Yet first, we should let ourselves be gazed upon by Our Lady. When she gazes upon us, she does not see sinners but children. It is said that the eyes are the mirror of the soul; the eyes of Mary, full of grace, reflect the beauty of God, they show us a reflection of heaven. There is no doubt that from the first moments of the Gospel, as seen in the story of the wedding feast of Cana, Mary knows how to make known to Jesus the needs of others, and she knows how to make the path of Jesus known to us. Throughout the ministry of Jesus, she remained the one who always accompanied him. Today she accompanies us on our search for Jesus. Mary is there to help us even when we do not expect it. Think of poor Bernadette, who sets out on a simple journey to find wood for her family. Mary surprises her and changes her life. How often pilgrims have had similar experiences during their time in Lourdes. Every year a team from the pilgrimage travels to Lourdes around the Feast of Our Lady of Lourdes to make preparations for the pilgrimage in September. As always during this visit we will take time to remember all the people who have asked for our prayers and light a candle on behalf of all who have previously travelled and who will travel with us in September. If you would like us to place a petition at the Grotto for you please send it to the Mission Office before February 5th. Please be assured of our continued prayers through-out the year and we conclude by offering this prayer to Our Lady: “We fly to thy protection, O Holy Mother of God”. 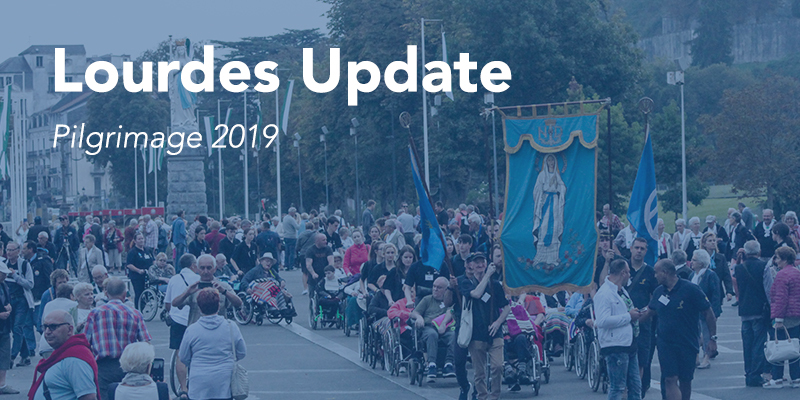 For more information on the 2019 Pilgrimage to Lourdes, please click here.